Prayer will be tomorrow at 6:30 PM. Children's and Preschool Ministry will begin at 6:30 PM. Snacks will be provided at 6:00 PM. 884-5932. 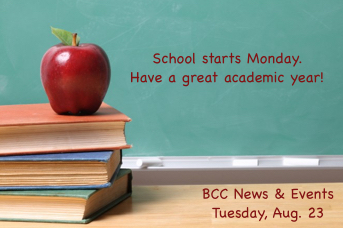 We are excited for the new school year. In December, we hope to deliver at least 500 pairs of NEW shoes to children in Williamsburg, KY. This Sunday is the last day that a table will be in the back of the Worship Center where you can bring NEW shoes or a monetary donation. Each child who receives a pair of shoes will hear a Gospel presentation in a one-on-one setting. Although this is the last Sunday for the table and display, you can bring donations to the church office after this Sunday! The men will have a breakfast on Saturday, September 3rd at 7:30 AM in the Student Center. An encouraging word will be shared. The Augustine Literacy Project is committed to providing caring, professionally trained tutors for those whose families cannot afford to pay. ALP is looking for two more potential tutors. Training is from September 5th through the 16th, Monday through Friday, from 8:30 AM to 2:30 PM. For more information, email Wendi Adair at brevardaugustine@gmail.com.